ADSL splitter is a small device that is used to separate the high frequency broadband signals from the low frequency telephone signals (POTS) that are used for voice calling. In simple words it separates the broadband internet signal from the voice signal and avoids any kind of interference between the two devices or signals. ADSL Splitter is also called ADSL filter, DSL filter, DSL Splitter, Phone Splitter, Internet Splitter or ADSL microfilter. If you want your landline telephone and ADSL Modem to work smoothly then you have to use an ADSL Splitter. If you don’t use ADSL Splitter then you will have too much disturbance and noise when you pick up your telephone receiver and may also face frequent disconnection of broadband internet. So an ADSL Splitter is must for an ADSL or DSL broadband internet connection. Previously I have written a detailed article on the problems faced due to ADSL Splitters and the measures to fix them. You can find that article by going to the link given below. You can find ADSL Splitter in the market or online for as low as 40 – 50 rupees but it will do you more harm than good. This is because these cheap ADSL Splitters can cause your Internet to work slow and you may face frequent disconnections and too much noise in your telephone line. So it is very necessary to buy a good ADSL splitter which will cost you at around 200 rupees or so. Next I will tell you on how you can find a good ADSL Splitter for your ADSL broadband internet. Here are the various ways by which you can find a good ADSL Splitter for your ADSL broadband Internet. Model Number – Every ADSL splitter available in the market has a model number written on it. 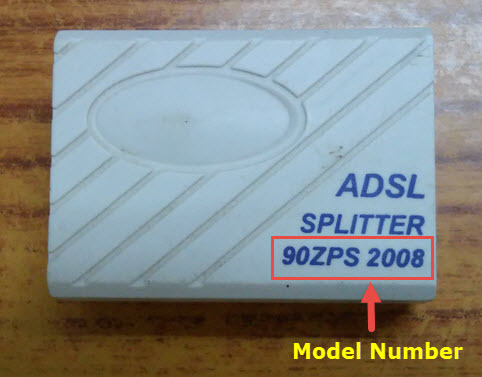 You can easily identify the quality of ADSL Splitter by simply looking at the model number. I have specified the model numbers of good quality ADSL splitters down in this post. Also I have listed the model numbers of the cheap ADSL splitters that you must avoid at any cost. Weight – If you are shopping offline then you can get an idea about the ADSL splitter quality by its weight. A cheap ADSL Splitter has smaller or cheap components fitted in it and the splitter weighs less than 10 grams or so, whereas a good quality ADSL splitter weighs at least 25 grams. You don’t need a weighing machine to conclude this as you can get an idea about the weight of the ADSL splitter by picking it in your hand. If the ADSL splitter feels a bit heavy then it should be good and if it feels too light then avoid it and look for another one. Brand (optional) – Branded ASDL Splitters are very hard to find especially in India but if you could do that then it is an added advantage. Good brands of ADSL Splitters are D-Link, TP-Link, Tenda etc. 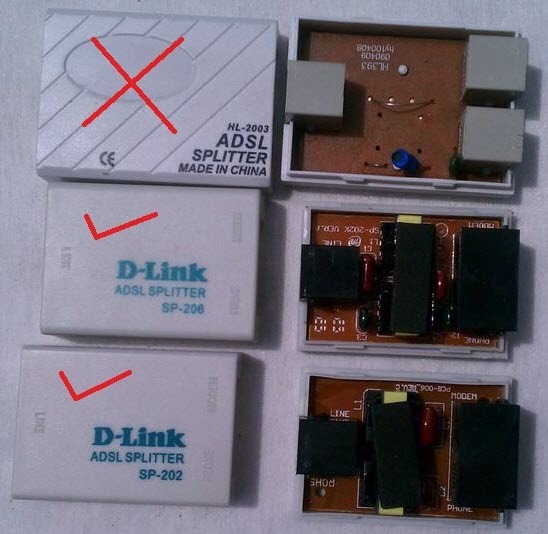 It must be noted that almost all ADSL Splitters are made in China. The main components of ADSL splitter are Capacitors and Inductors. 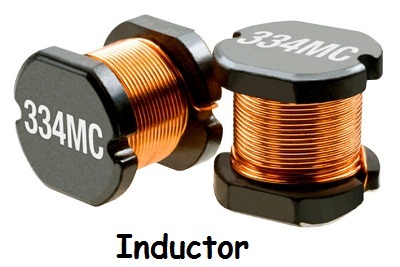 Inductor is just a coil of copper wire. Some ADSL filters do have couple of resistors also. Below is the circuit of good quality ADSL splitter and a cheap ADSL splitter. Here you will see the size and quantity of inductors in good quality ADSL splitter is bigger whereas in cheap and low quality ADSL splitter it is much smaller and also the circuit is minimum. Here is what an Inductor looks like. Note: In the first pic you will see a very small Inductor in blue. The components in the middle in the last two D-Link ADSL Splitters are Inductors which are much bigger in size. Here are some of the good and bad ADSL Splitters with their model numbers. Here are recommended ADSL Splitters that you can buy for your ADSL Internet. These ADSL splitters have good quality components and will keep your broadband internet signals and telephone line signals isolated. DSL-30CF is the D-Link ADSL Splitter and you can see it in the image below. You can also find SP-202, SP-206 and SP-208 models in D-Link as well as in other unknown brands. Here are the model numbers of the ADSL Splitters that you must avoid at any cost. These ADSL Splitters have low quality components and they will give you more problems than before. This is because these ADSL splitters are made of cheap and low quality components. Important Tip: ADSL splitters have a limited life and you should change your ADSL splitter in a year or two because the capacitors in these ADSL filters may lose its efficiency overtime. Well here I have talked about all the important things related to ADSL Splitter including their model numbers, advantages, disadvantages but if you have any doubts or queries then you can ask me by leaving a comment below. sp-206. 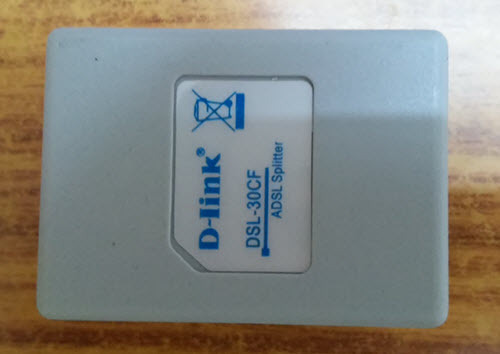 adsl-splitter for bsnl connection failed. please recommend new one to buy. You can get other models such as SP-201, SP-202, DSL-30CF from local shops as currently they are not available online. I am in Tirunelveli-627002 . Which shop this model is available. My mobile is 9442080750 . What Inductor is used in the Model DB-103-16-K . One of the inductor has come out because of mishandling by me. Is it possible to replace or repair ? NICE informative article . It helped me a lot in choosing good splitter .thanks . splitter model sp 202A is good one ? thanks for ur quick reply . Both are good and you can go with any of them and what is your broadband plan? I have bought CE GG2003 splitter and this is total waste of money. This dsl splitter doesn’t work at all. Previously I have been use CE SP-206 that was find and worked for me for at list three years. I am trying to buy splitter online but I don’t get it. I have been used two splitters yet first one was DB103-16k and CE SP-206 both worked for me and each one work for three years. Can you suggest me where I can get good quality of DSL splitter online? Most of online marketing website doesn’t sale D-Link and TP-Link DSL splitter and some but want to sale only in bulk order that I don’t want. Right now no good adsl splitters are available online. You have to try in the local market. Hi , may I know if HUAWEI HWSP-368 ADSL Splitter is a good model to buy? Thanks! SP-202 adsl splitter is good. Is TC-04 (TERACOM) is a good splitter ? After seeing the pictures of what is inside it, I think it is pretty good. Yellow triangle every 5/10/ 20/ 40 minutes causing net to fail. But says ‘connected’. Trouble shooting reconnects after a couple of tries. ( States cannot find DNS server). Old sterlite modem and new TP link modem 8901 also having same problems. But some times the net works perfectly for hours on the end.Sometimes within a few minutes upon starting the pc. a) Is it the fault of the modem or Adsl splitter or Mtnl, Mumbai. Try using public DNS server such as from Google. Follow this guide https://www.akshatblog.com/fix-your-dns-server-problems-by-using-public-dns-servers/. Also directly connect your line to the modem to check if the ADSL splitter is at fault or not. After this get back to me again. Thanks a lot Mr Aksat for your very quick reply to my last evening email.After reading your article , I remembered I had a unused D-link splitter , hunted for it and put into use and VOILA….no more drop outs of the net. Used the net for 2 hrs this morning and now on pc for about 3 hours and still no drop outs. The problem is solved. PS: for the last 2/3 months i have been hassled by this problem and searched the all over the net. People suggesting very different reasons for the same. Hi Mr Aksat, Ref: yellow triangle, July 8.July 10. Is your telephone line clear or there is any disturbance in it? Also try plugging the telephone wire directly in the modem without splitter and tell me your findings. Hi Mr A.Verma, the problem about ‘yellow triangle’ in the internet is quite rare now and I can live with that. Thanks a lot. to rid this problem, so in the future i can rectify the same. Thanks, francis Rodrigues. A little bit of this yellow triangle problem is from the bsnl server side and i face it too sometimes. I did not get your other question regarding wifi password. RedMi Note5 smart phone: Wi-fi connection only: For safety sake one has to enter the ‘PASSWORD’ into the ‘ column’ and press OK and phone is now in WIFI mode for use. Suddenly, yesterday instead of the ‘Password’ Column opening, ‘TAP TO SHARE PASSWORD” is shown below one’s name. When tapped a display opens up with a QR code with captions 1) Share Wifi network 2) To share,Scan QR code above. Below is OK. I bought a ADSL Wifi Router thinking of buying a BSNL Broadband connection unfortunately i have to relocate and here there is no BSNL connection available. So, can I use this ADSL router with normal Ethernet cable connection. Is there any splitter or any other suggestion you can give me???? Which ADSL WiFi router you have? Yes you can use it as Router too and no splitter is needed for it. So….i can just plug the Ethernet cable in to the LAN port of the ADSL Wifi router and can use it????? Yes but you may want to configure it as router only mode. Depends on router to router. I was going through the ones available in the market. Most of the models available online or offline, are the ones mentioned in the bad ones list. Also I found another model: YXSP202 – Is this a good one to have? I think it is the SP202 model only and is good to go. Very fine guidance! Thank you! I was using sp 202 with my old modem and I bought a new modem and sp 316 was included in it. Should I continue using 202 or switch to 316? I would say continue using SP-202 for now and keep SP-316 as backup.